A bed bug is a small, blood-sucking insect that feeds exclusively on blood. Bed bugs belong to the insect family Cimicidae. Recently, we have seen resurgence in bed bug infestations worldwide, including the U.S. and other developed countries. Bed bug bite identification is a useful skill. Adult bed bugs are reddish-brown in color, flat, oval-shaped, and about four to five millimeters in length. Although bed bugs are often more red in color after they feed, immature bed bugs have a more translucent or light color. They are attracted to warm areas and they generally feed during night hours. 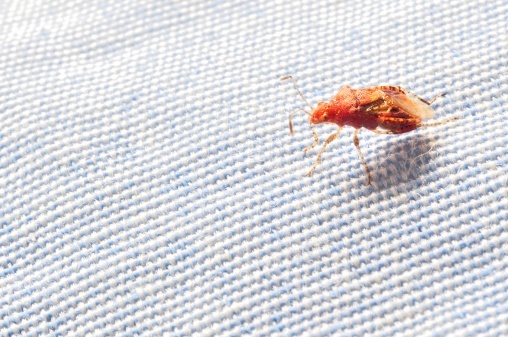 If you find blood spots or bug feces on your sheets—or bites on your body—you might have a bed bug infestation. Bites on the body are usually found on vulnerable or open parts when an individual is sleeping. This can include the face, neck, hands, arms, and legs. There are times where bed bug bites are all grouped together in a small area; bites could also occur in a line or zigzag pattern. Bed bugs can withdraw human blood for up to 10 minutes each time they feed. People who are bitten by bed bugs may develop severe itching, red welts, or swelling. A reaction may not occur right after a bite, but it can surface one day to a few days after the initial bite. If a person has been bitten many times, the response to the bite may not be as intense as it may be with someone who has not previously been bitten. Unlike most insects that bite, bed bug bites could appear in tight lines with multiple small red marks where several bed bugs have fed along. Initially, an individual who is bitten by a bed bug may feel a burning sensation. The burning sensation will then turn into itchy bumps, known as papules or wheals. In severe cases, the bites could swell dramatically or even turn into blister-like inflammations. The good news is—bed bugs do not transmit diseases when they bite you; although, bed bug bites can result in skin infections due to excessive itching and scratching. One could also experience insomnia because of constant worrying about getting bitten. If you are allergic to bed bugs, you may experience more dramatic symptoms. The most common symptoms of an allergic reaction include engorged bite marks with painful swelling and burning around the site. In rare allergy cases, you may experience an anaphylactic response. Bed bugs consume blood in order to survive. Once a bed bug inserts its “mouthpart” into the body and finds a good blood vessel, it will start feeding. Finding the right blood vessel could take more than one injection into the skin. Bed bugs are really sensitive to movement, so if the host they are feeding off of moves, the bed bug will usually withdraw its mouthpart and search for another vessel on the body. If you have multiple bites, it does not mean that they are from multiple bed bugs; it could just be one bed bug feeding on different parts of the body. Clean bed sheets, linens, curtains, and clothing in hot water and then dry on the highest setting. Place stuffed animals, shoes, and any other items that can’t be washed in the dryer and run it on high for about 30 minutes. Use a stiff brush and scrub the mattress to remove any bed bugs and their eggs before you vacuum. Vacuum your bed and its surroundings several times. After you vacuum, place the vacuum cleaner bag in a plastic bag, tie it closed, and place it in the garbage can outside. Patch up walls and re-glue wallpaper to remove places the bed bugs can hide. Get rid of any clutter and garbage around the bed. If your mattress has been severely infested, you might want to get rid of it and purchase a new one. Your main focus should be on the bed. Start with the headboard, which is held on the wall with brackets. Lift the headboard one to two inches then lean the top away from the wall to gain access to the back of it. Look for signs of live bed bugs squeezed into the cracks and crevices of the headboard. Next, pull the bed sheets back and inspect the mattress for evidence of bed bugs or cast skins. Check the curtains or furniture near the bed, including the dresser drawers and night stands. The next morning, double-check for blood spots on the sheets in case bed bugs discovered you during the night. Avoid packing clothes in drawers; place suitcases and any other baggage on luggage racks—keep the rack central in the room away from walls. Don’t place clothes or baggage on the bed or on the furniture. When you are not using your suitcase, always keep it closed and zipped. Store your clothing in a large bag to prevent any bed bugs from getting into them. Finally, while sleeping, you might want to keep a flashlight close to the bed in case you feel a bite. Flea Bites vs Bed Bug Bites: What’s the Difference? “Bed Bug Bites,” Orkin web site; http://www.orkin.com/other/bed-bugs/bedbug-bites/, last accessed August 3, 2015. “Bed Bug Precautions for Travelers,” Penn State College of Agricultural Sciences web site; http://extension.psu.edu/pests/bedbugs/precautions-travelers, last accessed August 3, 2015.